Better Barns was featured in Popular Mechanics magazine in 2000 and again in 2004, and due to the overwhelming response of readers, plans for all of our barns were made available for purchase. Since then, at the insistence of customers, a video was produced to help with the construction process. 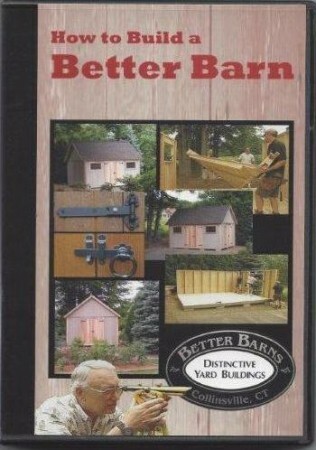 If you live outside the Collinsville, CT area and/or you choose to construct one of our barns from the 20+ plans we offer, do yourself a big favor and keep this DVD by your side as you “do-it-yourself”. The DVD was made during construction of Plan #2017, a 12×16 plywood Colonial barn, but is helpful putting up most of our barns, including the all cedar 12 x 16 Plan #2020 featured in the October 2004 issue of Popular Mechanics magazine.